Pittsfield Wedding Venue, Pittsfield Accommodation & 1 more. Specializing in destination Vermont weddings, this Vermont wedding estate hosts elegant and unique barn weddings, outdoor weddings, rehearsal dinners, ceremonies and receptions. Imagine your Vermont wedding of a life time as a three-day celebration. Specializing in destination Vermont weddings, this Vermont wedding estate hosts rustic but elegant barn weddings, outdoor weddings in our meadow, and rehearsal dinners and receptions in our 5 barns. Imagine your Vermont wedding. A three-day celebration including a delicious farm to table rehearsal dinner, a beautiful Vermont outdoor ceremony (with multiple weather back up options,) a magnificent reception and a farewell Sunday brunch, each utilizing a different location on the property. 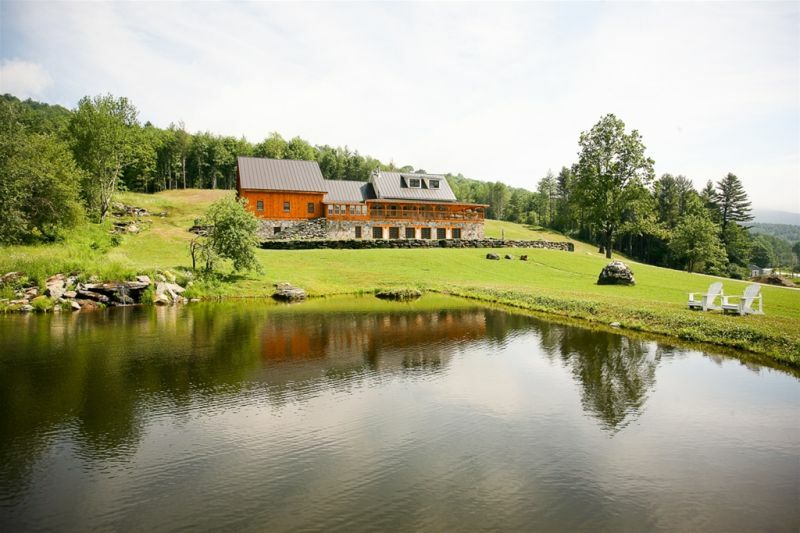 Nestled in the heart of the Vermont Green Mountains on scenic route 100 in Pittsfield Vermont, Amee Farm is less then a 10 minute drive to nearby Killington Resort. At this Vermont private estate with an on site working organic farm life's pace revolves around nature and finding time to do the things you love. Tube down the White River, hike or ride on our 50 mile on site trail network, walk the 1 mile stone staircase up the mountain, or simply sit and sip coffee and enjoy the fresh mountain air. About Amee Farm Lodge: Located on scenic Route 100 in the idyllic New England village of Pittsfield, our Amee Farm Lodge is the perfect Vermont bed and breakfast… relaxed country elegance at its best. The fully-restored post-and-beam farmhouse features 15 deluxe guest bedrooms with wide-planked pine floors, hand-hewn wooden furniture, comfy beds with Tempurpedic mattresses, and private bathrooms with stone-lined showers and lovely large rain showerheads. There are several spacious common areas, including an inviting wrap-around porch with Adirondack chairs for admiring the scenery and the resident farm animals. The property boasts 40 scenic acres complete with two ponds, a waterfall, hiking and biking trails, and farm animals to visit. The farm stand across the road currently features fresh eggs, goats cheese, and seasonal greens. Pittsfield offers an abundance of activities, energetic or otherwise. There is always something exciting and unique to do. Many folks come to Pittsfield simply to seek out old-fashioned country quiet, savoring the chance to relax and enjoy the beauty of nature, to visit with the farm animals across the road, to gaze in wonder at the brilliant colors during fall foliage, or to stroll through the village green with a latte from our quintessential Vermont general store. Others come to enjoy a mellow tube ride down our river, sample some local maple syrup, or take an inspiring visit to the local art gallery featuring marble, limestone, wood, and stone sculpture products. Pittsfield is also a prime location for outdoor enthusiasts, no matter what the season. Surrounded by the lush Green Mountains, Pittsfield has renowned hiking, mountain biking, and snowshoeing trails. In fact immediately across the road from the Lodge you will find the entrance to Green Mountain Trails, boasting 20 miles of trails that stretch across 750 acres. In the warmer months we rent bicycles and organize multi-day road bike tours from our Lodge, and for the golfers out there, it’s only a 10-minute drive to Vermont’s #1-rated public golf course — the 18-hole Green Mountain National Golf Course. Mountain Biking: Enter the Green Mountain Trails from Riverside Farm, Amee Farm or one of the other public entrances. The Green Mountain Trails are a fast growing multiuse network of flowy singletrack over varied terrain in Pittsfield and Stockbridge, Vermont eight miles North of Killington. Mountain bike, trail run, hike, snow shoe on some 50 mi. of stellar trails. We have trails for all abilities, passing by mountain streams and overlooks, with a beguiling panorama of The Green Mountains and pastoral valley at the summit that can't be missed. There is a thousand feet of climbing and descending. Though a majority of the trails are relatively smooth and flowy, there are several miles of rooty, rocky, technical singletrack. Over 100 bermed switchbacks make the long descents a blast for mountain bikers. Most of the uphills are gradual and forgiving on the quads, but challenging uphills are also an option. Depending on your route, descents can linger for as long as six miles. The entire trail system is free to the public.